The New HORNET 37EFI-T water jetting unit is a result of customers asking for a more powerful, but compact jetting system. This system is designed for domestic & commercial maintenance plumbers that require a powerful water jetting unit that is still compact. A industrial remote control can be fitted to the Hornet 37, that has a reliable 500m range. No more cheap, unreliable garage door remote controls! The Hornet comes complete with all the accessories required to immediately start cleaning drains. With twin reels mounted directly to the unit, mounting to your vehicle is a breeze without the expensive fit-out required with remote reels. 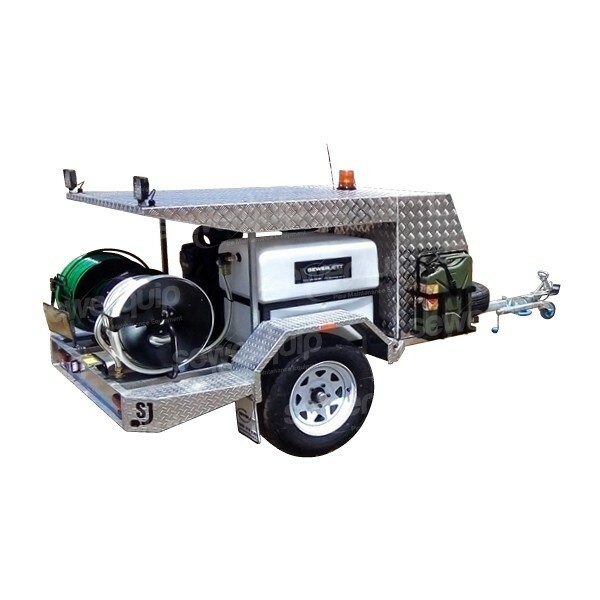 Simply bolt this impressive unit down to your ute, truck, trailer or van and you are ready to start professionally jetting those blocked drains, knowing that you have ample power to cope with any job. 35Lpm / 5070psi for 50-350mm Drains. Genuine 37hp Fuel injected Vanguard engine. Genuine Hawk Triplex ceramic piston pump. Market leading fuel efficiency due to the EFI engine. Industrial remote control option with 500m+ range. Large mounted Tool Box, store your accessories & camera equipment.